The mission of Love in the Name of Christ is to mobilize local churches to transfrom lives and communities In the Name of Christ. 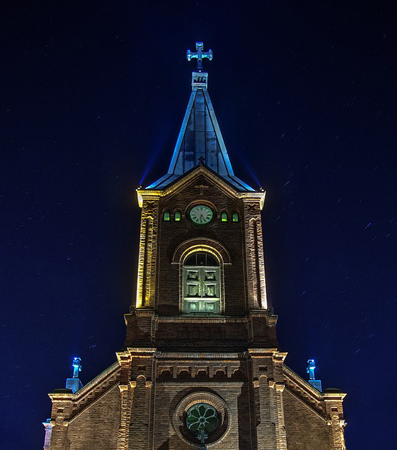 By 'mobilizing the local churches' we mean bringing the Body of Christ together to do local mission work in their community, with a variety of different churches and a wide spectrum of volunteers. By transformation we mean, being willing to enter into relationships which have the potential to change lives. We focus on the needs of the entire person - including things like their spiritual needs, relational needs and mental needs - in addition to their physical and financial needs. We are more concerned with longer-term results than instant gratification. Each life transformed impacts others around them and the more lives touched, the greater impact it will have on the community. The Clearinghouse call-in center is the foundational ministry of Love INC where volunteers from many churches listen to callers, share the love of Christ over the phone, and connect them with local resources - including church ministries, to help people find the solutions they need. 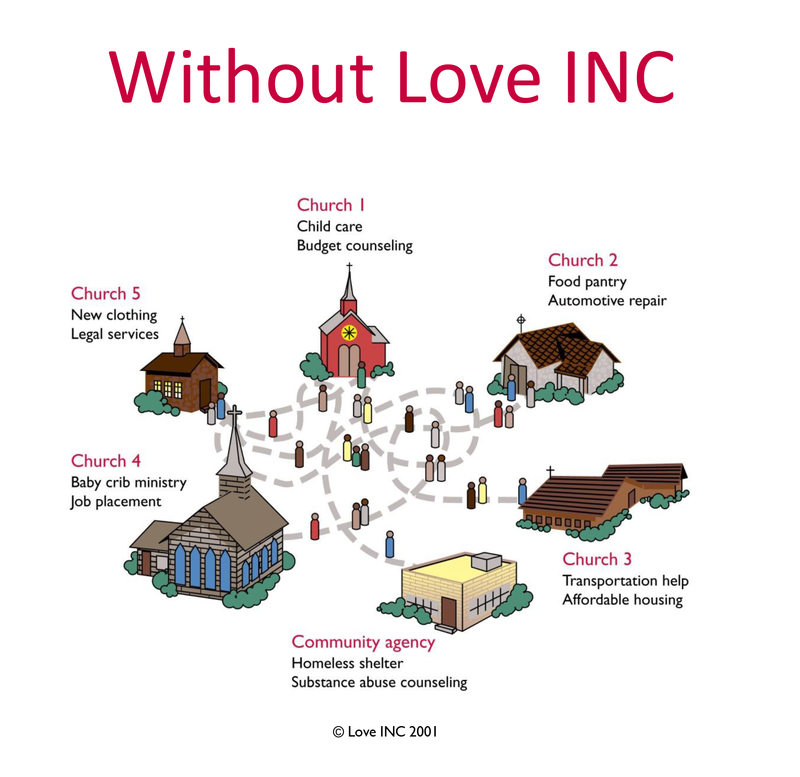 The picture "Without Love INC" shows people in need going from from church to church and agency to agency seeking assistance. 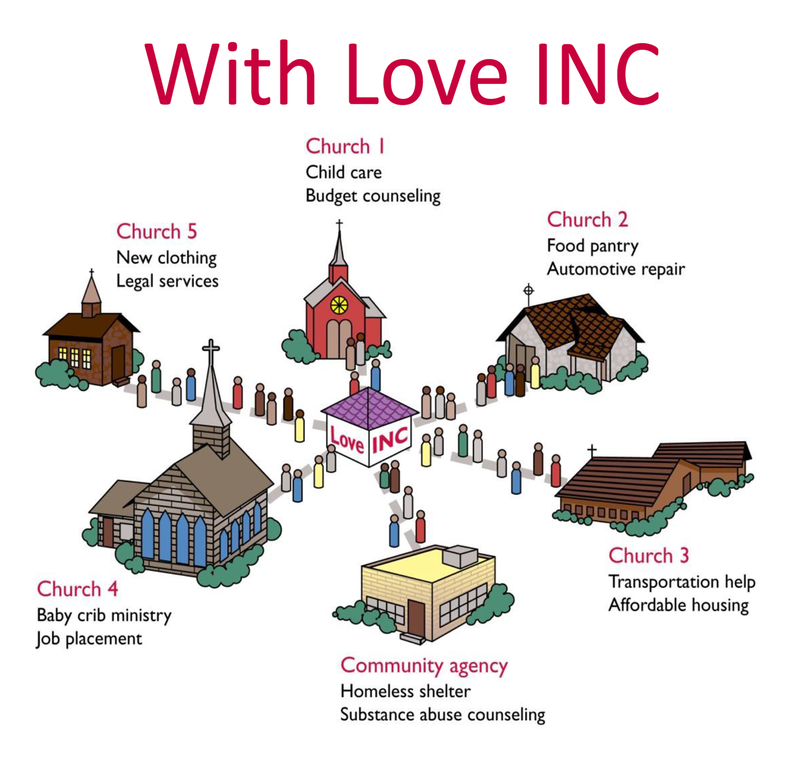 The picture "With Love INC" shows churches and others referring people in need to the centralized Clearinghouse call-in center for assistance. The call-in center provides coordinated, efficient and effective screening of requests for help, discerning the nature, extent and legitimacy of each need to prevent duplication of effort between churches and with existing community resources. Click on the links in the purple navigation box to learn more about other Love INC ministries, and what it means to be a Love INC Church Partner. Our mission is to mobilize the local church to transform lives and communities in the name of Christ. LOVE is a partnership of many local Christian churches, working together to unify the church around our neighbors in need.